New installations of Meyer Sound CAL column array loudspeakers are delivering intelligible speech along with clear music reproduction in two acoustically problematic worship spaces, with one room also benefiting from a subtle acoustical re-balancing courtesy of a Constellation acoustic system. 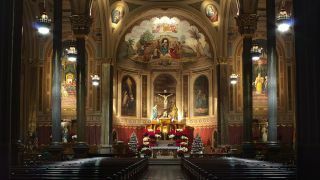 Mounted snugly in niches flanking the altar, the custom color-matched CAL 96 loudspeakers virtually disappear within 19th century Italian Renaissance Revival architecture of Mother of God Catholic Church in Covington, KY, providing a boost to the sound quality for the contemporary music. At Saint John Paul II National Shrine in Washington, DC, what formerly was an unremarkable meeting and exhibit space has been exquisitely transformed—visually and aurally—into the Redemptor Hominis Chapel. Direct reinforcement of speech and occasional music is supplied by a pair of CAL 64 column array loudspeakers. To create an acoustic that is ideal for traditional Catholic worship, the Jaffe Holden team also specified a Meyer Sound Constellation acoustic system. Design for the church’s audio renewal was entrusted to consultant David Walters of Stan Roller and Associates. His plan called for acoustical treatment of the rear wall to eliminate slap echoes and replacement of ungainly custom loudspeaker boxes—dubbed “the refrigerators” because of their bulk and profile—with a beam-steering column solution. a split-beam configuration, the top segment of 64 drivers employs a 10-degree vertical beam to cover the middle and rear sections, throwing nearly 100 feet to the back pew, while the bottom 32 drivers project a 20-degree beam to uniformly cover the front sections. Intelligibility proved excellent, considering the extremely reverberant acoustics, with Walters reporting STI readings of 0.65 or better throughout the seating area for about 600. The project’s system integrator was George Smith of Cincinnati-based Smithall Electronics. “Of all the beam-steering columns out there, Meyer Sound CALs are exceptional in both their sound quality and controllability,” said Andrew Nagel of the Norwalk, CT consulting firm Jaffe Holden. In this application, the beam angle and vertical spread of the CAL loudspeakers are calibrated to carry highly intelligible speech to the rear pews—a distance of about 90 feet—without overexciting what are effectively the “live” acoustics of a large church. At the core of the system is a D-Mitri digital audio platform, the host DSP engine for the patented VRAS acoustical algorithms. Ambient room sensing is via 14 miniature condenser microphones, and the desired acoustical characteristics are reproduced by 18 MM-4XP self-powered loudspeakers, 13 Stella-8C installation loudspeakers, and 10 MM-XP subwoofers.